The Nigeria Women’s U-20 team, the Falconets, are through to the next round of the 2018 FIFA U20 Women’s World Cup qualifiers. 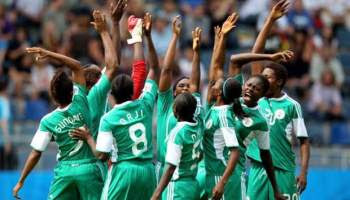 The Falconets booked their passage in style as they thrashed their Tanzanian counterparts 6-0 in Dar es Salam on Sunday. Having recorded a 3-0 win in the first leg tie a fortnight ago in Benin City, Edo State, the Falconets posted a 9-0 aggregate win over the East Africans. In Sunday’s second leg tie played in Dar es Salam, four goals came in the first half and two in the second half as the Falconets romped to the massive win. Go grls!